...Things, devices, and computers are also able to access and send information over the internet. Industries across the board have to re-evaluate their strategies due to this new technology. The Internet of Things (IoT) has also caused many new inventions to be birthed. These inventions are changing the way we live in our homes and it’s only the start. 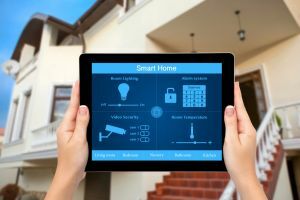 Let’s look at some interesting stats and figures that details the rise of the IoT and smart homes. IoT is a vast network that stretches wherever the internet reaches. Humans use the internet to send and receive information. Devices interact with the internet in exactly the same way. It also sends and receives information over the internet. Many smart devices that use IoT are also equipped with Artificial Intelligence (AI). AI helps smart devices to learn and predict patterns by studying new information or gained experience. A smart home is a bunch of smart devices that have is connected over the IoT. These devices predominantly use wireless connections to send and receive information. Smart home products have been invented to automate home experience. Why are Smart Homes becoming so popular? Smart homes are becoming more popular in the U.S. The growth rate of the adoption of the technology is quite fast. Why do people want these devices in their homes? Here are the main reasons why people want this technology. According to Safeatlast.co, 57% of American smart home owners are currently saving about 30 minutes per day due to the use of this technology. These devices are designed to communicate with each other. You can even program these products yourself with the help of simple smartphone apps. You can for instance program your smart refrigerator to connect to your smart oven. Download a recipe to your smart refrigerator from the internet. It will then read the recipe back to you as you prepare the meal. Your smart fridge will then switch your smart oven on and preheat it to the desired temperature. This is just a simple example. You can connect multiple devices to each other and create new ways of collaboration between your devices that will help to save you time. 45% of American smart home owners save about $98.30 per month. That adds up to a yearly saving of $1,179.60. Smart thermostats are one of the most used smart products on the market. It is believed that it helps to save its owners about 20% in yearly warming and cooling costs. Many people say smart home products are too expensive. It currently is the cutting edge technology on the market. So it will be the most expensive units on store shelves. But, if you use these devices wisely you may gain savings while using it. You may even save more than the original unit of the specific device. Automation has something else in mind as well. It wants to save effort. Smart home products want to help you by taking some tasks off your hands. Take robot vacuums for instance. You can set those devices up to vacuum your floors in times when you are not at home. You don’t need to spend that effort anymore. You can hand that whole task over to your smart vacuum robot. There is no future if we destroy it. Humans have already had an adverse effect on nature, but smart home technology wants to help save the Earth. Product features and other new inventions aim to make smart home products eco-friendly. Smart irrigation systems are usually hooked on to non-potable water tanks. These tanks collect washing and rainwater for irrigation purposes. This helps to save water (and it saves on your water bill too in the process). Drought-stricken areas can still relatively maintain fair-sized gardens with these inventions. What Are Some of the Most Used Products? Think of any room in your house. There is a smart home product you can use in it. Here are some of the most popular products used per room. The bedroom is all about comfort. You go there to relax and sleep. The following list of products wants to make your bedroom the comfiest place in your home. These devices want to help give you the optimal rest available. It will help you to get the most out of every night’s sleep and it will wake you up at the most opportune time. To make sure that you feel fresh and well rested for your day. Did you know that you can even automate your bathroom experience? Smart showers are now able to heat the water to a preset temperature of your choice. So too will smart toilets help by saving water with different flush modes. These products want to help save you time and money whilst it increases the comfort of your bathroom experience. Most homes have entertainment rooms where people do some gaming and TV watching. Merging the viewing and gaming experience of a home is one of the latest developments in entertainment technology. Companies are striving to find the best way to combine gaming, online viewing subscriptions, and basic cable. Couple that with an automated home entertainment system and you’ll never want to leave your coach again. The viewing experience in a smart entertainment setup is seamless. You can go from watching something like Netflix to playing something straight from your phone. This you can do while someone else is watching the sports channel in the room next door. You can have the movies right at home complete with your own popcorn and drinks. People have fixated by kitchen gadgets for decades now. Smart home products also have a few up its sleeve. What initially started out as a way to save time in the kitchen has now led to ways of saving money too. Here are some of the most used smart tech in kitchens all around America. These units can connect to each other like all smart devices. But, it’s in your kitchen where smart device interaction comes alive. You can download recipes from the internet onto your smart fridge. It will also help orchestrate the rest of your kitchen appliances as you prepare the meal. Do you want an extra hour to yourself over the weekend? Buy yourself a smart lawn mower and you won’t ever have to cut the grass again. This unit can run independently on a preset schedule. It will even keep the weather in mind and refrain from mowing the lawn when it’s raining. There is even more smart tech for your garage and backyard. You can have a backyard that will almost run itself. That sounds like a good weekend. Obviously, there are some smart devices that are installed in most rooms to help the automation process of a smart home. These devices aren’t made for specific rooms and are therefore welcome in any room. Smart security products are a good example. Smart displays act as a hub for all your connected smart devices. Place it in a central accessible room in the home and control all your smart devices at the touch of a screen. In a recent poll, 81% of prospective house buyers in America would rather buy a home with smart home products pre-installed. Devices like smart security products, lights, and showers can in many cases be installed while a home is being built. The high demand for smart products may soon cause interesting reactions in the prices of real estate equipped with smart devices. I’m a Beginner, What do I Need to Know? So you’re starting out with your own smart home setup. You’ve had your eyes on a couple of devices for a while now. What do you need? And what tips will help you? Here are the basics about starting your own smart home setup. Smart home devices can work their magic as long as it’s connected to the internet. No matter what product you buy or where you place it in your home. Make sure that your Wi-Fi reception can reach the unit or else it will lose its remote functions. Be especially sure that any smart devices in your backyard will receive your Wi-Fi reception. Most probably you are buying products from different suppliers. It’s also possible that these products struggle to interact. You can use 3rd party platforms powered by IFTTT (If This Then That) technology. IFTTT is basically a chain of reactions that take place each time a certain activity is launched. Smart security products work on an IFTTT basis. An alarm is triggered whenever a motion sensor picks up unpermitted movement. You can also connect smart lights to a smart doorbell. Whenever the doorbell has rung the lights on the front porch will automatically switch on. There are hundreds of apps available that will help you to connect the different smart devices in your home. You can also buy a smart assistant if you are keen to spend more money. Smart assistants can help to control other devices through simple voice commands. Smart devices may be able to access the internet, but many of these products don’t have sufficient antivirus software. These devices are extremely vulnerable to malicious software. Hackers are able to gain access to your whole network once they have accessed something like a smart security camera on your system. This places all of the devices on your network at risk. Encrypt your Wi-Fi with WPA2 (Wireless Protected Access) to place a line of defense between yourself and cybercriminals. This will help to protect devices without dedicated software on your network from outside attacks. Smart devices have some nifty features, but you need to understand how it works to gain the best results. Take smart lawn mowers, for instance. These devices need a housing unit for it’s charging station. And the charging station needs to be close to the designated piece of lawn it needs to mow. So the housing unit for this piece of technology needs to be within reach of your Wi-Fi reception, close enough to the lawn, and it needs a supply of electricity. Knowing this will help you to make the necessary preparations for a successful installation of the product. You don’t want to buy an expensive piece of technology to find that it can't work yet. Understand how it works and what it needs to succeed before you just buy the unit. America has not even begun to see what rapid change will take place due to this new technology. IoT has already changed the digital world. Our homes are next in line. It’s the way of the future. Are you ready?